OXFORD, Miss. – The late college and pro football player Doug Cunningham enjoyed a life defined by great affection for his family and friends, the University of Mississippi and his two restaurants. But there was something else – the great value he placed on education – and that has inspired a scholarship in his name. 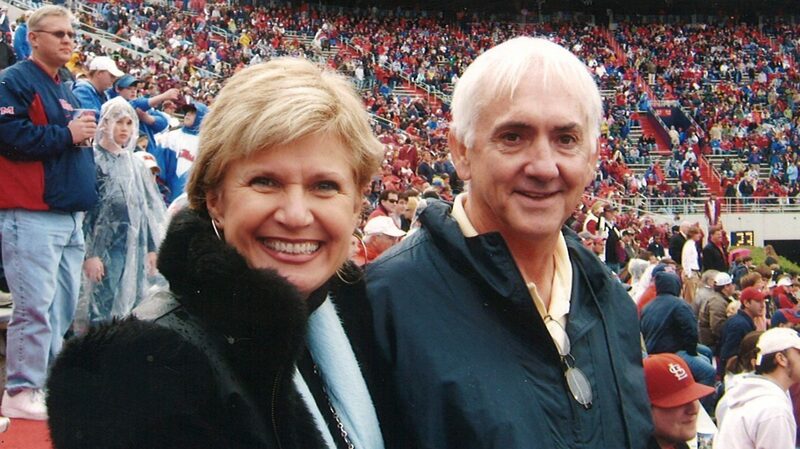 “Doug loved Ole Miss and for as much as he loved athletics, education was of primary importance to him and our family,” said his wife, Allen Cunningham, of Jackson. “While playing football, Doug majored in pharmacy, which is an academically rigorous field of study. Cunningham, who died in 2015, attended Ole Miss on a football scholarship offered by legendary Coach Johnny Vaught, playing halfback, wingback and kick returner. He averaged nine yards each time he touched the ball over three varsity seasons. In 1966, he led Ole Miss to an 8-3 record and was named All-Southeastern Conference. He played professionally for the San Francisco 49ers for seven seasons and then for the Washington Redskins for one season. During his years on the Oxford campus, Cunningham was as revered off the field as on it. The student body voted him Colonel Rebel (now known as Mr. Ole Miss). “Doug was a Rebel to the core. He loved Ole Miss and Ole Miss loved him back,” said his wife, who has made a recent major gift to create the Doug Cunningham Memorial Scholarship Endowment. Former Ole Miss teammate, Rebel running back and NFL player Dr. Mike Dennis, of Oxford, recalled the two years he and Cunningham played together. “Doug was one of the most humble and the friendliest people I knew,” Dennis said. “Everyone loved him. Anyone would have wanted to be his teammate or his friend. He also later became a very well-respected player in the NFL. Endowed scholarships profoundly affect individual lives, the university and beyond, said Charlotte Parks, UM vice chancellor for development. “We are deeply grateful to Allen Cunningham for creating such a meaningful tribute to her husband, Doug,” Parks said. “Many young people cannot afford to seek college degrees, and this new scholarship will transform lives by providing access to educational opportunities. First preference for the scholarship will be given to students from Grenada and Winston counties in Mississippi, Allen and Doug Cunningham’s home counties. Selection will be based on financial need, and those applying must have a grade-point average between 2.0 and 3.0. Recipients may retain the scholarship for up to eight semesters if they maintain a minimum 2.0 GPA and remain in good standing. Doug Cunningham graduated from Louisville High School in 1963 after earning All-Southern, All-State and All-Conference honors during his senior season. Coached in high school by Fred Morris, he was selected Most Valuable Player in the Choctaw Conference in 1962, when Louisville High won the league championship. His combination of pure speed and elusiveness made him one of the most dangerous open-field runners in Mississippi football annals. Once fully engaged in his collegiate career, Cunningham created many memories for Rebel Nation. In 1966, Ole Miss trailed the University of Southern Mississippi 7-0 in the fourth quarter. USM had never beaten Ole Miss on the gridiron, but all indications pointed to a Golden Eagle win that day. That is, until USM unwisely chose to punt to Cunningham. “The Rebel Return Man, Doug Cunningham, No. 22, sprang from nowhere, took the ball, and was immediately surrounded by white jerseys. He was hit, broke a tackle, hit again, shook himself free, darted one way then the other and suddenly emerged from a pile of humanity with his legs pumping, his knees high in the air, his hips twisting, and two blockers in front of him. The crowd erupted. Cunningham cut to the sideline … and hit the afterburners. Cunningham was inducted into the Mississippi Sports Hall of Fame and the Ole Miss M-Club. After his football career, he became a popular Jackson restaurateur, known for his graciousness, charm and wit in his operations of both the popular Gridley’s and Swensons. “(Doug) always made me smile,” Cleveland recalled. “He often made me laugh. And he always made me want to be more like him. Allen Cunningham also graduated from Ole Miss, following in the footsteps of many family members. As an undergraduate, she was a member of Kappa Delta sorority and the Committee of 100, a religious emphasis group. After earning her degree in elementary education, she enjoyed a 35-year career in teaching. To make a tax-deductible gift to the Doug Cunningham Memorial Scholarship Endowment, send a check to the University of Mississippi Foundation with the name of the scholarship written in the check’s memo line. Contributions can also be made online at http://give.olemiss.edu. For more information, contact Nikki Neely Davis, executive director of development, at nlneely@olemiss.edu or 662-915-6678.